Knit Picks is skilled at advertising and marketing. For one, their catalog featuring real women in fabulous sweaters gathered from current pattern books is outstanding. The models look great, you can totally identify with them, and you get a realistic idea of how different styles look on different bodies. This approach works better for me than the Interweave Knits galleries on Knitting Daily. The styles in the Knit Picks catalog are more varied, as are the models in terms of age and size. I was pleased. 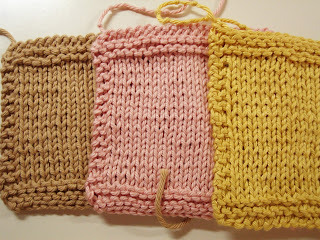 The package includes Comfy (pink), Shine Worsted (yellow), Main Line (sand - looks orange in photo above), Cotlin (green), Shine Sport (ivory), and Crayon (blue). 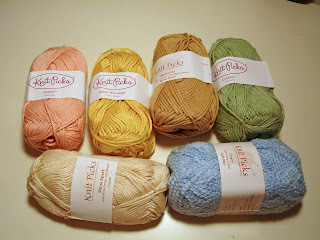 I swatched four of them and now I know more about Knit Picks yarn than I did before. Maine Line (sand) is a worsted weight blend of 75% Pima cotton and 25% Merino wool. I have always liked this combination because it looks and wears like cotton, but gains the elasticity of wool. In this case, the sample, knit on #8 (US) needles, was quite firm, lacked drape, and was less elastic than I had expected. But it knit up evenly and would be fine for a sturdy sweater. I'd like it for outerwear. Crayon (blue) is one of Knit Picks' few novelty yarns. It is a light weight boucle of 100% cotton. It's perfect for children's blankets and toys. I don't see it as a garment for either children or adults. Comfy (pink) is Knit Picks' newest. It is worsted weight but knits up light and thin. It is 75% Pima cotton and 25% acrylic. For the second time in recent memory I have fallen in love with a synthetic (blend). 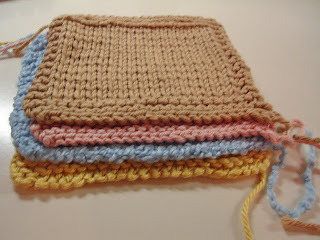 The first time was Berroco Comfort (all synthetic). This yarn is soft and caressing, and very summery. Perfect for a tank. Shine Worsted has problems. This blend of 60/40 cotton/modal looks gorgeous in the skein. It has rich color and delicious sheen. It is the most edible-looking of these yarns. But I hate how it knit up on #7 needles. It's uneven and inelastic. I want to try it again on a smaller needle, but I doubt that I would use this yarn. Because of this I didn't bother to try Shine sport. I'll keep it for stash. I am curious about Cotlin, a dk blend of cotton and linen, but I don't want to swatch it yet because I am saving it for trim on a current project. Fun exercise! I've knit quite a bit with Shine Worsted. It's nice on size 6 needles for me. The Shine Sport I like even more, esp. on a small needle like a size 3. I ordered Comfy this week to give it a try on a small project. I'm glad to hear I won't be disappointed.